In my review of Turkish oud master Mehmet Polat’s CD Ask Your Heart, I described the music as “the emotional and visceral possibilities envisioned in each piece, and the collection as a whole, are cultivated with the care of the aforementioned flowers in the garden, yet at the same time, with seriousness and intensity.” Polat and his new ensemble Embracing Colours takes this to a new level in their CD / digital release Quantum Leap.” A quantum leap is a term in subatomic physics describing the discontinuous change of the state of an electron in an atom or molecule from one energy level to another. The term is also described in metaphorical terms as an abrupt, extreme change. This begs the question of how Polat and company intended to bring this out in the music. 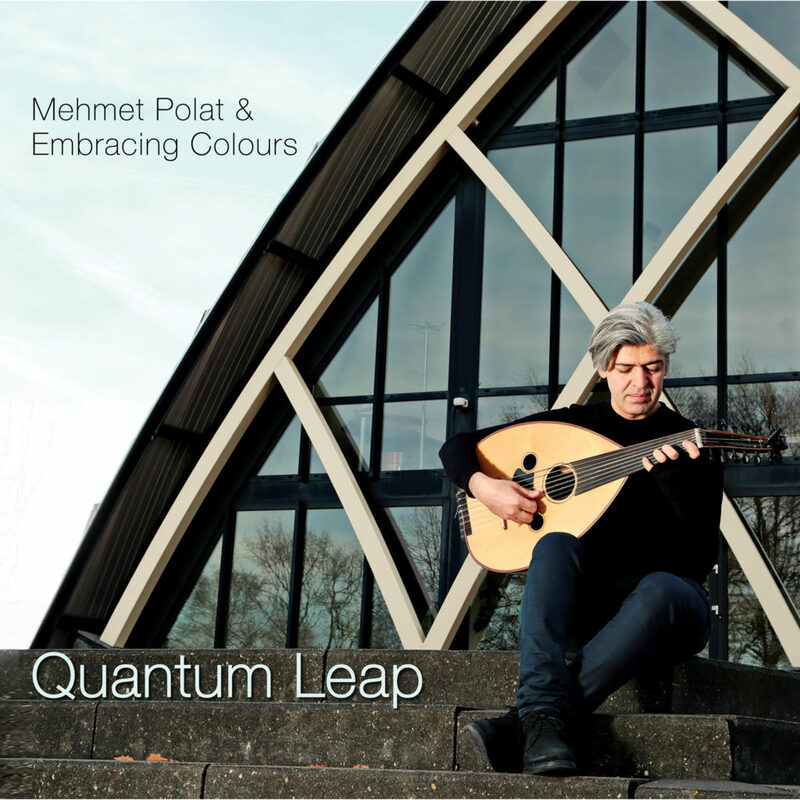 On this CD, Polat (oud & compositions) is joined by Embracing Colours members Joan Terol Amigo (Catalonia, drums), Hendrik Müller (Germany, bass), and Bart Lelivelt (Holland, accordion). The recording is augmented by special guests Ciğdem Okuyucu (vocals), Eric Vloeimans (trumpet), Imamyar Hasanov (kamancha), and Michalis Kouloumis (violin). The first track, “Expanded Lives” begins with a musical statement on the oud that almost resembles a Bach figure. The drums, bass, and accordion come in and present a backdrop that is very near to jazz, yet the harmonic atmosphere of Middle Eastern and European music is clearly manifest. The composition explores and constantly reinvents its theme. Polat’s oud solo draws from the inner mood of the piece. The others in Embracing Colours provided a jazz background. The song’s bridge veered into an almost flamenco-like controlled intensity before returning to its beginning. “Dancing Status” opens with Lelivelt offering a tango before the band comes in with a furious syncopated attack. After an impressive display of chops, the mood changes to a more subtle infusion of eastern and Moorish colors. The title is quite accurate; the piece conjures images of sultry dancers whose suggestion of sensuality is subtly overshadowed with a suggestion of danger. “All Connected” begins with one of the most unique performances on trumpet I ever heard. Eric Vloeimans proves himself to be a master at bringing out unimagined colors in the trumpet. His interplay with Polat is marvelous. Mention must also be made of the kamancheh work Azerbaijani musician Imamyar Hasanov brought to “Breathing Again.” The liquid and haunting lyrical melodies Hasanov infused over the deceptively free-form rhythms are indescribable. The whole of Quamtum Leap explored an amazing variety of musical ideas. Polat has extended the beauty and power of the music he brought in his previous release, and continues to present one masterpiece after another. Mehmet Polat “Ageless Garden” CD Isssss Outttt! This entry was posted in CD Reviews and tagged CD Reviews, Dawoud Kringle, Mehmet Polat & Embracing Colours, oud on March 31, 2019 by Sohrab Saadat Ladjevardi.